How Are You Celebrating Advent This Year? It’s the last day of November, and Advent is here! Chances are (if you’re in the U.S.) you’re just now fully recovering from the Thanksgiving holiday last week. But with Thanksgiving behind us, we’ve officially entered the countdown to Christmas. And while that stretch of time holds a lot of pleasant experiences—Christmas music, time spent with family, Christmas-themed activities at school and church, etc.—it’s also usually marked by a hectic pace, jam-packed schedules, and financial stress. With all of that packed into just one month, how can you possibly experience spiritual peace this holiday season? One simple way you can stay spiritually grounded this Christmas season is by participating in the season of Advent. Advent has just begun; now is a perfect time to choose to participate. 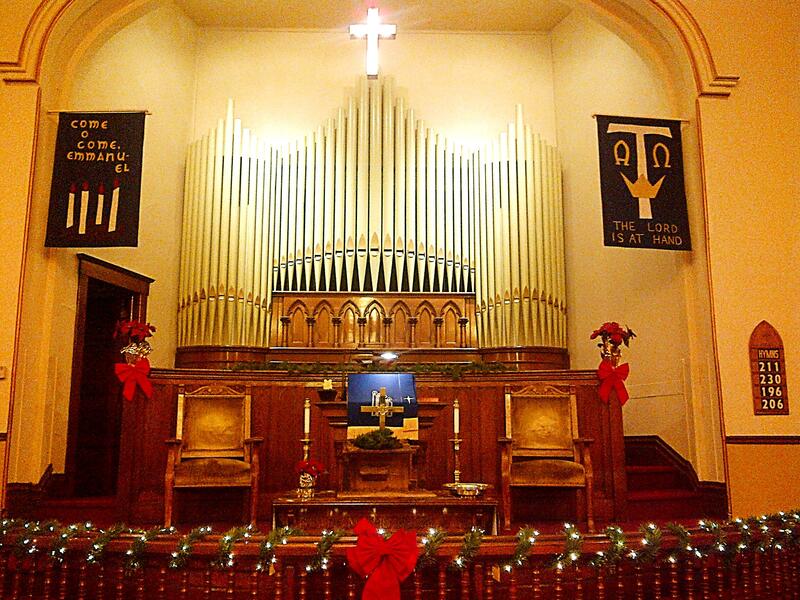 Advent won’t add stress to your life; you don’t need to buy presents for it. Advent is simply the period of time leading up to Christmas, during which Christians around the world take a bit of time to reflect on the true meaning of the holiday. It’s specifically meant to pull our attention away from our everyday worries and focus it on the person of Jesus Christ instead. 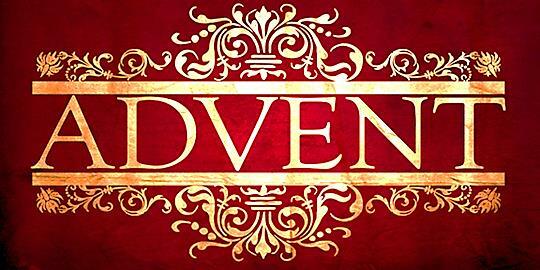 Advent reminds us of Jesus’ first coming two thousand years ago, while pointing us to his long-awaited second coming. 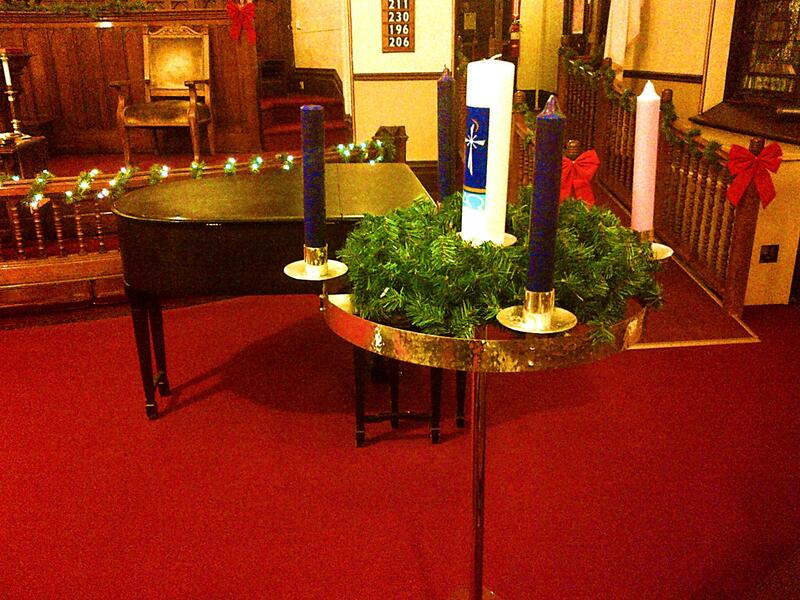 Central Church is of course observing Advent this year— including special Scripture readings, the lighting of Advent candles, and the use of purple and blue in decorations. However, Advent is even more rewarding when you observe it not just at weekly worship services, but in your personal life throughout December. Read the Bible Daily – Commit to read the Bible for five minutes (or whatever amount of time fits into your schedule) each day. Read a section of the Bible – Challenge yourself to read a particular section of the Bible during Advent. This doesn’t need to be a huge commitment—reading through one or more of the Gospels would be very thematically appropriate, and easily do-able in a month. Spend Extra Minutes in Prayer – Spend a few extra minutes each day in prayer, perhaps centered around a particular theme. For example, you might pray for a different person in your family, church, or community each day. Read a Daily Advent Devotional – Find and read a good devotional during December. Central Church is offering another series of Advent Devotionals this year right here on our website, but you could also track one down at your local bookstore, Church library, or elsewhere. Practice Charity – Go out of your way each week during Advent to spread grace in your community. This might mean running errands for somebody who can’t do them on their own; volunteering or donating at a food pantry or other organization; visiting somebody who needs company during the holidays; buying groceries for a family struggling to make financial ends meet; or whatever else you can dream up. There’s no limit to what you can do to observe Advent, nor any requirement that you observe it in a particular way (or at all). But if you could use an extra dose of spiritual peace and joy this Christmas season, try commemorating Advent in a way that makes sense for your life and situation—you’ll find that time spent focusing on Jesus Christ will put the rest of your hectic holiday schedule in a healthy perspective. A Blessed Advent Season to You from your friends at Central Church! For many Christians unfamiliar with the liturgical year, there may be some confusion surrounding the meaning of the Advent season. Some people may know that the Advent season focuses on expectation and think that it serves as an anticipation of Christ’s birth in the season leading up to Christmas. This is part of the story, but there’s more to Advent. Advent symbolizes the present situation of the church in these “last days” (Acts 2:17, Hebrews 1:2), as God’s people wait for the return of Christ in glory to consummate his eternal kingdom. The church is in a similar situation to Israel at the end of the Old Testament: in exile, waiting and hoping in prayerful expectation for the coming of the Messiah. Israel looked back to God’s past gracious actions on their behalf in leading them out of Egypt in the Exodus, and on this basis they called for God once again to act for them. While Israel would have sung the song in expectation of Christ’s first coming, the church now sings the song in commemoration of that first coming and in expectation of the second coming in the future. David wrote this psalm after his own son, Absalom, had staged a coup and had himself crowned king. David and his men (see 2 Samuel 15-19), fled Jerusalem and retreated across the Jordan River. Eventually, in a battle there, Absalom was killed and his army defeated. David was reinstated as king and returned to his capital. From ground level (vv. 3-4) how does David describe his situation? Do you think David feels resentment toward those who’ve placed him in harm’s way? How does David believe his antagonists evaluate his position? How does a “bird’s-eye” view (v. 7) alter the equation? What key conviction about God does David repeat (vv. 1-2 & 5-6) to shore up his own confidence? What does David see as his appropriate response to this confidence? Why did David write so many psalms? What is his advice to his people (v. 8) when they face periods of stress? Do you find that laying out your anxieties before God in prayer releases tensions you’ve been feeling? Spend Time in Prayer: Ask God to forgive you for worrying and for forgetting how much He loves you and cares for you. 1 I wait quietly before God, for my victory comes from him. 2 He alone is my rock and my salvation, my fortress where I will never be shaken. 3 So many enemies against one man—all of them trying to kill me. To them I’m just a broken-down wall or a tottering fence. 4 They plan to topple me from my high position. They delight in telling lies about me. They praise me to my face but curse me in their hearts. 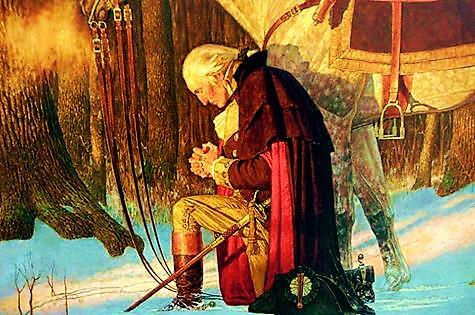 5 Let all that I am wait quietly before God, for my hope is in him. 6 He alone is my rock and my salvation, my fortress where I will not be shaken. 7 My victory and honor come from God alone. He is my refuge, a rock where no enemy can reach me. 8 O my people, trust in him at all times. Pour out your heart to him, for God is our refuge. Prayer for the Week: You are my hiding place. One morning as I fretted about an important decision in my life, I took a walk to clear my head. Across a park lawn, I saw a beautiful golden retriever frolicking alongside his loving master. Oh, I mused, to be as carefree as that dog, to play and run freely, knowing that your master will provide for all your needs. When we worry, we’ve unthinkingly questioned God’s wisdom (that He knows what’s best), His love and goodness (that He cares for us and wants what’s best), and His sovereignty (that He’s able to do what’s best). I recalled a cowering stray dog a friend of mine had found. Even after she adopted it, the dog trembled each time someone reached to pet it. My friend believes the dog was probably abused by its former owner. When I allow my heart to tremble in anxiety, am I communicating to others that my Master is uncaring and unfaithful? My Response: Could my anxiety stem from unbelief or doubt in God’s character? 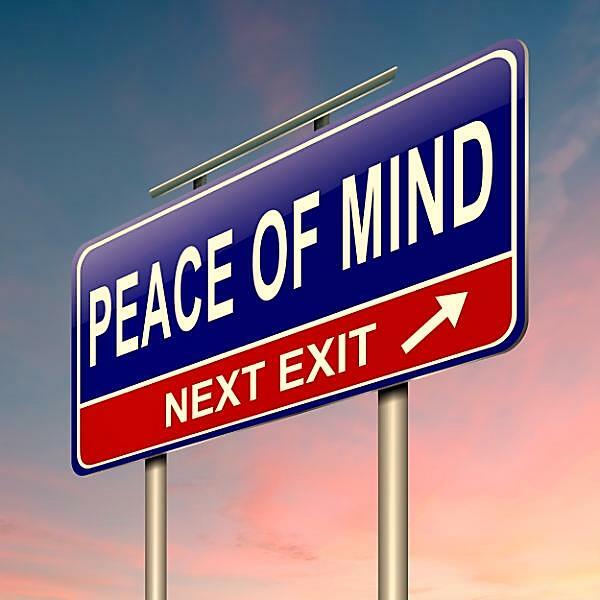 Weed Out Worry – Shaky or Sheltered? As a child I walked a mile to school with my two best friends. Along a quarter of that distance was a railway. We always walked on the rails. Each wanted to make it that whole stretch without falling off, but didn’t want the others to similarly succeed. We’d throw things at each other to upset balance, or say things to divert attention, cry out that the train was coming, or announce that there was a dead body in the ditch. Some have supposed that that’s what Christian living is: teetering and wobbling along a rail, taunted by the devil. With some skill and a lot of luck, we might just make it to heaven, but it’s an uncertain business at best. Psalm 125 says it’s not that way at all. Being a Christian is like sitting in Jerusalem, fortified and secure. So the last sentence is “Let Israel have quietness and peace.” A colloquial, but in the context accurate, translation would be “Relax.” We’re secure. God is running the show. Neither our feelings of depression nor the facts of suffering are evidence that God has abandoned us. There’s nothing more certain than that He’ll accomplish His salvation in our lives and perfect His will in our histories. My Response: How can I factor God’s protection and provision into my outlook? “as a day of public thanksgiving and prayer to be observed by acknowledging with grateful hearts the many and signal favours of Almighty God”. Gratitude is joy toward God for his grace. But by its very nature, gratitude glorifies the giver. It acknowledges its own need and the beneficence of the giver. Just like I humble myself and exalt the waitress in the restaurant when I say, “Thank you,” to her, so I humble myself and exalt God when I feel gratitude to him. The difference, of course, is that I really am infinitely in debt to God for his grace, and everything he does for me is free and undeserved. But the point is that gratitude glorifies the giver. It glorifies God. And this is Paul’s final goal in all his labors: for the sake of the church — yes; but, above and beyond that, for the glory of God. The wonderful thing about the gospel is that the response it requires from us for God’s glory is also the response which we feel to be most natural and joyful, namely, gratitude for grace. God’s glory and our gladness are not in competition. A life that gives glory to God for his grace and a life of deepest gladness are always the same life. And what makes them one is gratitude. Black Friday… Cyber Monday… GIVING TUESDAY, December 1, 2015! Every week, Central Church creates an environment where members of our community can get a hot, nutritious meal, and meet and talk with members of the Church and other members of the community. A gift of any size strengthens the value of Central Church’s ongoing community ministry. What: Give to Central Church during #GivingTuesday. When: December 1, 2015. Until then, you can simply click on the “Donate” button on any page of Central Church’s website (www.centralumchurch.org) to give an early contribution. How: Share the reason why you love Central Church on social media, “Like” us on Facebook, and use photos, too! Mark your calendar for December 1! One summer we visited Yolanda’s parents in Desert Hot Springs, California, where temperatures hit 119 degrees. As I began a late-morning run down the street, the dry heat felt invigorating. But after more than two miles of virtually effortless gliding, I decided to turn around and head for the house. Desert Hot Springs is perched on a 15-degree incline, and my in-laws’ house is near the top. Facing more than two uphill miles in triple-digit heat under a cloudless sky, I ran four blocks, walked one; ran two blocks, walked one; ran 30 feet, walked the rest. By the time I lurched through the front door, I was seeing spots. An hour after hydrating and a cooling shower, I still felt weak. Yolanda and I left for a drive to Palm Springs, but my anxiety heightened as I drove. Everything seemed dark. I’d never passed out before; was I about to? Was I having a heart attack? An aneurysm? Heat stroke? Glaucoma? I look around the locker room and see my players trying to get into the “zone.” I’ve worked hard to get them prepared, but the team has the pregame jitters! Maybe they think they aren’t as talented as their opponent. Or they lack confidence in the game plan. Maybe they don’t want to look bad in front of all those fans and media. Or they’re nervous that they won’t live up to their own expectations. Whatever, the result is worry and a lack of focus. All of us who’ve competed know that pit-of-the-stomach feeling. Sometimes we’re not even sure if it’s fear or excitement, whether we should scream or cry. The men around Jesus had the jitters, too. Like us, they had anxiety about everyday life. But in today’s Bonus Reading, Jesus put the “game” in proper perspective for His followers. He told them that if God takes care of the needs of ravens, He’ll also take care of those worth much more to Him than birds. Jesus went on to remind His disciples that worrying is wasted energy. Then, in case they were still tempted to worry, He went further, proving God’s faithfulness by willingly taking their sins to the cross! So why should we worry about our game? My Response: On what can I focus to replace my fears? Weed Out Worry – Too Vulnerable? Michael sat on his bed in a rented room in Tucson, Arizona. With guitar in hand and Scriptures open before him, he experimented with setting part of Psalm 32 to song. At 27, Michael Ledner was on fire for God—but also separated from his wife of nearly ten years, and feeling rejected. Writing “You Are My Hiding Place” in an hour or so was cathartic. He recorded it, put the tape on a shelf, and ignored it for nearly a year. “I’d be in congregations sharing songs, but I didn’t do anything with that song,” he says. “It has words I felt were not real manly: hiding, afraid, and weak. Later I realized that we all hide. My Response: What do I do when feeling inadequate or rejected? Eugene Peterson is known for his contemporary translation of the Bible, The Message. But this Montana-raised man isn’t in to public acclaim. He’d rather teach a class than speak to a large audience. After years as a pastor in Maryland and as professor of spiritual theology at Regent College in British Columbia, he’s now retired. Eugene used to climb mountains and run the Boston Marathon. Those activities are out now, but still in are picking banjo and telling bear stories. When mountain climbers are in dangerous terrain, on the face of a cliff or the slopes of a glacier, they rope themselves together. Sometimes one of them slips and falls—backslides. But not everyone falls at once, and so those who are still on their feet are able to keep the backslider from falling away completely. And of course, in any group of climbers there is a veteran climber in the lead, identified for us in the letter to the Hebrews as “Jesus, who both began and finished this race we’re in” (Hebrews 12:2MSG). Traveling in the way of faith and climbing the ascent to Christ may be difficult, but it is not worrisome. The weather may be adverse, but it is never fatal. We may slip and stumble and fall, but the rope will hold us. Three times in his great Sermon, Jesus, knowing how easily we imagine the worst, repeats the reassuring command “Don’t worry” (Matthew 6:25,31,34). Our life with God is a sure thing. We think of the Psalms as wonderful examples of praise to God and powerful expressions of the range of human emotions in relating to God. We probably don’t think of them as instructional. But here’s a catechism lesson! What does David’s question imply about God? … about what separates people from Him? Why isn’t David’s answer about ritual purity or offering sacrifices? Is the conduct David describes an unreachable ideal or a basic reflex that can be drilled into our lives with the help of the Holy Spirit? What kinds of consistency are required by verse 2 over time? … between words and actions? … between the public and private? … between ends and means? Does mere external conformity to moral standards cut it for David? Could you do the things to be avoided (in v. 3) while remaining strictly truthful? What does verse 4 tell you about being morally discerning? In our interest-based economy, what kinds of “gouging” are still prohibited? What does “stand firm forever” mean? How does it refer back to David’s question? Spend Time in Prayer: Ask God for the strength of character to actually be what you claim—as a model to those who observe your life, and to prepare you to live in His presence. 1 Who may worship in your sanctuary, Lord? Who may enter your presence on your holy hill? 2 Those who lead blameless lives and do what is right, speaking the truth from sincere hearts. 3 Those who refuse to gossip or harm their neighbors or speak evil of their friends. 4 Those who despise flagrant sinners, and honor the faithful followers of the Lord, and keep their promises even when it hurts. 5 Those who lend money without charging interest, and who cannot be bribed to lie about the innocent. Such people will stand firm forever. Prayer for the Week: May the choices I make, Lord, honor You, showcasing Your transforming power at work in my life. Years ago I purchased a dilapidated trailer to haul our family bikes for vacations. Several summers later, I took it to the local U-Haul to have work done on the taillights for an upcoming trip. Soon after the mechanics went to work, the store manager came out and informed me that the trailer I owned was stolen! We couldn’t find a serial number, but the design matched an older model of U-Haul trailers that he showed me in a catalog. Scratching through several layers of paint, we uncovered U-Haul’s trademark orange color. The company never sells used trailers to the public, the manager assured me, so this had to be stolen. When I came home and reported, my kids loved it: “Dad bought stolen goods!” But I knew they were watching me closely, wondering, What’s he going to do? I really wanted to get on with the trip, but knew I had to give up the trailer. Soon after I told my family this, the manager called and offered the use of one of his trailers for our trip—free of charge. Because I made the right choice that day, my kids learned a powerful lesson: God takes care of you when you honor Him with your actions. In the very early days of Inmac, we received a shipment of tear-resistant envelopes from a supplier. During the unpacking, I accidentally sliced into one-third of the envelopes. It sickened me, because those represented 5 percent of the money for our fledgling company’s inventory. I couldn’t bring myself to remove the damaged items from the inventory. When the first order for those envelopes arrived, I shipped a number of defective ones without thinking twice about it. Suddenly all of our orders stopped. Not a single call for three days. As I was praying that night, I remembered those envelopes and sensed that God was trying to get my attention. I asked Him to forgive me for cheating that customer and vowed to make it right. First thing the next morning, utterly embarrassed, I apologized for my mistake to my bewildered part-time employee. Then I rushed out a replacement shipment to the customer. My Response: How am I practicing honesty, service, and excellence on the job? But there was a hitch: Long before the LLWS team opportunity came up, Bryndan had given the coach of his neighborhood team his word (and so had I) that he would be playing with his team that summer. This was a dilemma; if Bryndan played on the LLWS team, the skill level, exposure, and number of games would really contribute to his development. Yet, as we thought and prayed about it, I concluded that Bryndan’s word meant more than taking advantage of a great opportunity. Defining Choices – Mickey Mouse Rules? It wasn’t a huge lie. People do it all the time. It was easily rationalized: She wasn’t tall enough to ride all the rides, so we shouldn’t have to pay full price for her ticket. Those parks are ridiculously overpriced anyway. And besides, if they cared enough, they’d be more scrupulous about checking age. Those excuses flooded in but were stopped in an instant by a simple fact: I was being dishonest. Worse, I was modeling dishonesty to my child, and even dragging her into it. Hardly worth a $20 difference in the price of a ticket! Since that day, I’ve made a commitment to play by the rules. If the menu says kids’ meals are for a certain age, we abide by it. If the adult-priced ticket costs too much, we don’t rationalize; we just stay home. My track record so far isn’t perfect. But I know that every time I follow the rules, even when no one else does, I’m placing another block of character in my fortress, ready for the larger tests ahead. My tires screeched rounding a corner at the airport parking garage. Debbie and I were running late. I spotted an open parking space. Backing up to squeeze in, I forgot about the trailer hitch we’d just installed. It hit the car behind me. I jumped out to inspect a slightly damaged bumper. The right thing was to leave a note—but taking the time to do so would make us miss our flight. Besides, the car was old, with dents and scratches. The damaged plastic probably would have no effect on the car’s owner, I told myself; but missing our flight would have a big effect on us. “We’ve got to get to that plane!” I announced, and headed for the terminal. “I know,” she replied without a hint of misgiving. So I wrote a note with my phone number, and left it on the damaged car. We did miss our flight, but lined up a later one and enjoyed a leisurely lunch. My Response: Am I attempting to ignore, or listening for, that inner voice? 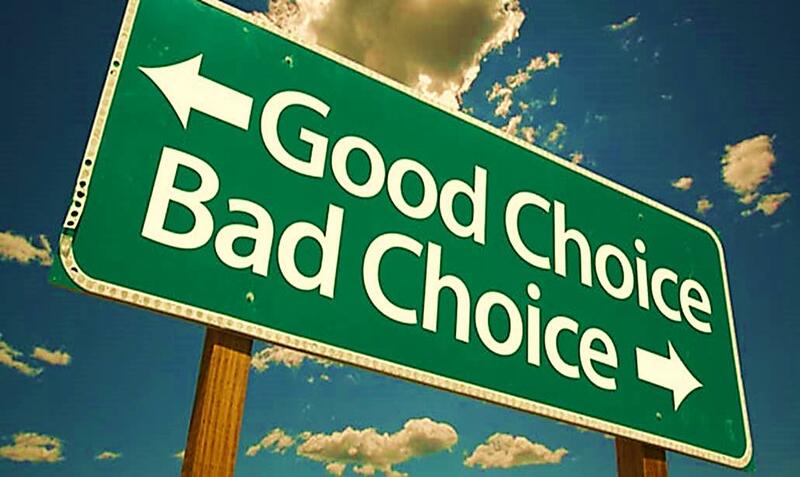 Defining Choices – Stroke of Lick? Kris lives in the Southern California foothills with his wife, Celine, and son, Skye. His love of dogs shines in Four Paws from Heaven, a book he co-authored. What He Said…Stroke of Lick? One day I received an unblemished 55-cent stamp and proceeded to do what I’d always done. Suddenly, a Scripture came to mind: “My God will meet all your needs according to his glorious riches in Christ Jesus” (Philippians 4:19, NIV). My brain launched into dialogue with my Creator. Now any uncanceled stamp I receive in the mail I toss into the trash. God doesn’t want me to cheat over a stamp when as His child He’s promised to meet all my needs. “Look at the prophets,” James advises, as examples of godly suffering. But a lot closer to home for most of us is an example of how to go about waiting. For that, James declares, “consider the farmers.” They can’t hurry the growth of their crops. But neither can they take the summer off. There’s work to be done in the fields as they wait for the harvest to ripen. Can the farmer force his crops to ripen any faster? Can we hasten the Lord’s return? Are you eagerly looking for His return? Why (v. 8) should you take courage? How does patient waiting for the Second Coming apply to other kinds of waiting? James cites Job (v. 11) as an example of patience. Why does Job-like endurance deserve “great honor”? How did Job’s trust finally end in good (see Job 42:10-17)? Might you, like Job, never have God explain to you the reason for frustrations or delays you experience? But can you, like Job, ultimately bank on God’s character, described here as “full of tenderness and mercy”? Spend Time in Prayer: Ask God for humility and hope that will transform your approach from irritable impatience to steady endurance. Prayer for the Week: Thank You, Lord, for Your infinite patience. Grant me a composure of spirit that reflects Your character. Impatience and What’s Behind It – Why Wait? A friend walked into the study of the great 19th-century preacher Phillips Brooks and found him pacing back and forth, terribly agitated. “Dr. Brooks! What on earth is the matter?” he asked. Isn’t that the way it often seems to be with God? You desperately want something apparently legitimate and worthwhile, and you’re forced to wait. I’ve become convinced that at least as important as the things we wait for is the work God wants to do in us as we wait. Waiting with grace requires humility. Our culture scorns humility. It values people who “take charge of their lives” and seize life by the throat rather than wait. You and I will receive no applause for waiting. Our humility comes from being clear that we exist for God’s sake, not He for ours. And hope is essential to waiting. There’s a logic to the world’s frenetic grasping for everything now. It has given up on a future that is anything more than an extension of the present. Since it has no great eternal hope to wait for, why wait for anything else? And many Christians live as though there were no tomorrow that shines with God’s promises. My Response: Could how I’m “going for it” betray a deficiency in my hope? I don’t like to wait and I don’t wait very well. I’m the guy who cuts across the grass to get there faster. When there’s a line at the market, I watch for another check-stand to open and try to get there first. When I played baseball, I wouldn’t wait on the curve ball, and in track I’d jump the gun at the start. But my friend Don Springer, a retired fisherman, taught me a lesson about waiting. I love to snorkel. There’s almost nothing I’d rather do than swim in the clear blue waters of the world looking at tropical fish, coral, and the underwater world. Don and I went snorkeling in Napili Bay, Maui, Hawaii. He drove me crazy. He couldn’t swim for six feet without stopping for minutes at a time. But a funny thing happened when I waited for Don. I saw more fish, more eels, more movements in the water than I’d ever seen before. Although I’d snorkeled at Napili Bay before, I never truly experienced Napili Bay until Don showed me how to wait. It’s a good lesson for life. Maybe we should quit rushing around trying to find God. Maybe we should stop, look, listen, and wait. He’s here. He has something to reveal and say to you today. St. Petersburg Men’s Ensemble at Central Church – TONIGHT! If you weren’t planning on attending the free concert by the St. Petersburg Men’s Ensemble at Central Church tonight, CHANGE YOUR PLANS! Our Russian friends will perform at Central Church at 6:00 tonight. The sound is AMAZING! – Four men singing in close harmony without amplification. The sound just shimmers in the air. If there is any way humanly possible for you to make it tonight, get to Central Church by 6:00 and be amazed! BEAVER FALLS — An acclaimed vocal quartet from Russia will perform Thursday at Central United Methodist Church in Beaver Falls. Following the 6 p.m. concert, Central Church will host an informal reception with light refreshments, where concertgoers will be able to chat with the performers. A selection of the quartet’s CDs will be available as well as native Russian craft items. This marks the second straight year the St. Petersburg Men’s Ensemble has entertained at Central United Methodist as part of the church’s community outreach ministry. “The concert on October 22, 2014, was a huge success, and we asked our new friends to keep Central Church in mind if their future travels could again bring them within an acceptable distance so we could have them perform here once again,” Charles Aley, president of the church’s board of trustees said. In order for the concert to occur, Central Church was required to send a letter to the Consulate General at the U.S. Embassy in Moscow to certify the performance was part of an important cultural exchange. There’s no admission charge and the doors will open at 5:30 p.m. A free-will offering will be accepted with proceeds going to the ensemble. 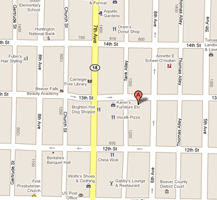 The church is located in downtown Beaver Falls at the intersection of Sixth Avenue and 13th Street. Impatience and What’s Behind It – Purpose-Driven or Just Driven? Driven people are fanatical time managers. Living on purpose requires skillful time management, true, but not the kind that turns brittle, that attempts to quarantine most of what makes life itself—the mess, the surprise, the breakdowns, the breakthroughs. Too much rigidity stifles purpose. I find that the more I try to manage time, the more anxious I get about it. And the more prone I am to lose my purpose. The truly purposeful manage time less and pay attention more. The most purposeful people I know rarely over-manage time, and when they do it’s usually because they’re lapsing into a loss of purpose for which they over-compensate with mere busyness. No, the distinguishing mark of the purposeful is that they notice. They’re fully awake. Jesus, for example. He veered and strayed from one interruption to the next, with no apparent plan other than His single, overarching one: get to Jerusalem and die. But He noticed. And those driven to get and spend, to judge and exclude, He called to attention. Look at the birds! Do you see this woman? Where are the other nine? My Response: How is my desire for efficiency hurting my relationships? 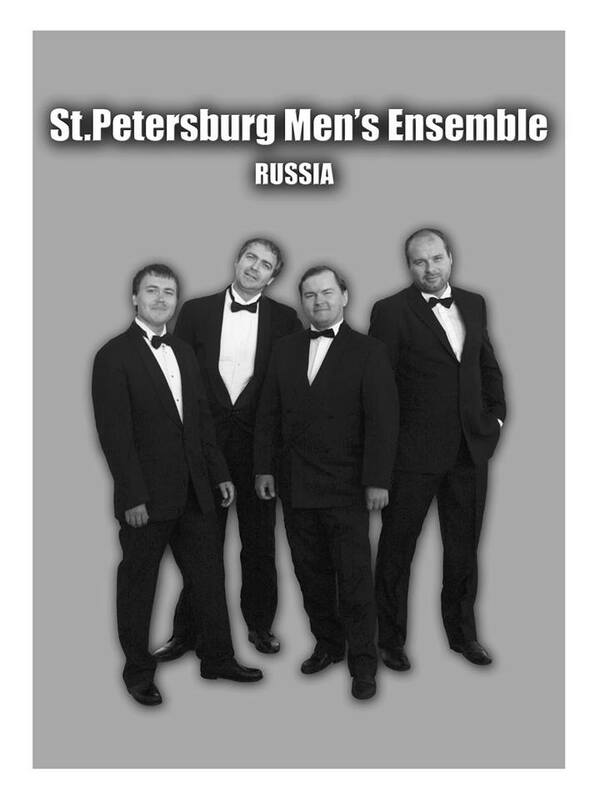 Central Church is hosting a special concert of the St. Petersburg Men’s Ensemble on Thursday, November 12 at 6:00 p.m. The concert is free and open to the public—please help us get the word out. 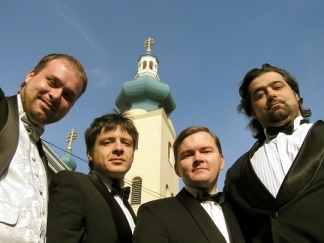 The St. Petersburg Men’s Ensemble, which includes the talents of Kirill Sokolov, Sergey Shapinsky, Vadim Smanster, and Andrei Volikov, has been performing in churches and concert halls throughout the United States since 2002. Their concerts reflect their culture and heritage, with a balance of sacred songs by Russian composers and Russian folk songs. The members of the St. Petersburg Men’s Ensemble bring extensive training and experience to the presentation of their concert selections. They have sung with many choirs including the State Academic Capella and the Choir of Smolny Cathedral. This year’s concert selection will feature choral works by Berezovsky, Hassler, Lotti, Mozart and Rachmaninoff amongst others. CDs and Russian gifts will be available for sale. A free-will offering will be received to support their U.S. Tour. So please call all of your friends and invite them to on November 12 for some great music and a time of informal fellowship afterwards where we can chat with our guests from Russia! My father is a gifted carpenter. When I was young, I spent many hours with him carrying lumber or fetching his tools. I learned the name of every tool in the box, and what they’re for. Dad is retired now. He and Mom sometimes come to visit so he can help me with a project: building steps from our deck or a new piece of furniture. And I’m still learning from him. Especially about patience. In the time it takes him to meticulously measure and cut every board just right, my mind has raced ahead, dreaming up more “efficient” ways to speed up the process. I have to stop and ask myself why. Those hours with Dad are a blessing, and I know from experience that his slow, steady methods are better than mine. Nevertheless, I often feel impatience creeping in. Patience isn’t natural. It’s supernatural. It’s an outgrowth of the presence of the Holy Spirit in our lives! We can’t muster it well on our own, and frequent impatience is often a signal that we’re not fully connected with God’s presence in our lives. When I think about Dad’s patience, I’m even more grateful for God’s patience when I’m sure I know a better way. 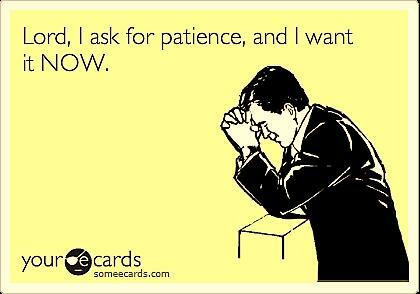 My Response: The next time I feel impatient, I’ll pause and thank God for His patience. What happens when your wife inconveniences you? Does she have habits that “get on your nerves”? For example, you ask her about her day, and she tells you—in Technicolor, with footnotes! You get links to other sites in her brain along the way. And all the time, you’re thinking, Will you please land this plane! What’s the point? What’s the main idea? In older translations of today’s Key Bible Verses, you’ll read, “love suffereth long“ (ASV). The root of impatience is usually selfishness. We’re not getting what we want or what we think we deserve. We don’t suffer long; rather, we think we’ve suffered long enough! A young Christian man asked an older believer to intercede for him. “Pray that I’ll grow in patience,” he asked earnestly. His friend suggested that they pray together right then and there. “That’s what I was doing,” the older man replied. My Response: What irritant may God be using in my life to produce endurance? Gordon MacDonald has been a pastor and author for more than 40 years, chairs the World Relief board, and is an avid hiker. He writes mostly about issues of self-discipline, ordering one’s priorities, and developing a deep spiritual life. I am standing in line at the post office and feeling this impatience. I used to think of myself as a patient man, but now I’m not so sure. I find a flicker of irritability rising in me at other times too: when everyone else decided to clog up the interstate at the same time I wanted to drive it, when someone sends me an e-mail file that takes ten minutes to download. I have a suspicion that these bits of impatience really echo other aspects—maybe more significant aspects—of my life that I refuse to face. So I push myself to stop and think about my idiotic, immature reaction. Why am I upset because I’m going to lose four or more minutes in my schedule? What’s the deeper impatience? Where’s the anger coming from? This moment in the line becomes a tutorial for my character. There will be moments ahead when this “fruit of the Spirit” will be needed for far greater issues than this one. Learn patience here so that you’ll have it then. Before God ushered in the Church, Paul acknowledges, Jews were the accepted insiders while the Gentiles were the excluded outsiders. But now, he insists, these barriers of exclusivity, both religious and racial, have been dismantled. So to what extent has the elimination of these barriers been reflected in our congregations? What characteristics differentiate people in your church from those in other churches in your community—theological perspective? Age? Political persuasion? Race? Economic status? Intelligence? Appearance? Is it fair to consider any of these to be dividing walls? In what specific ways (vv. 14, 16, 18) has Jesus’ death removed the walls that people erect between themselves? How, according to verse 15, did Jesus break down the “wall of hostility” between two groups? Do you think that continuing to think and react in terms of separate groups undercuts Christ’s sacrifice for you? Spell out how the unity of the Church involves each member of the Trinity (v. 18). Spend Time in Prayer: Ask God for wisdom to discern the extent to which the diversity of His Church universal ought to be duplicated in your local fellowship. Prayer for the Week: Lord, Your Church should be validating Christ’s reconciling power. Help me to do my part. At the inner-city Chicago high school where he coached, Wayne Gordon launched a Fellowship of Christian Athletes program. Guys lifted weights in his storefront apartment and talked about serious issues. When Wayne’s bride, Anne, moved into the ‘hood with him, the gathering took on a coed flavor. The newlyweds urged several youths who became followers of Christ to become involved in a good church. But after an in-depth Bible study on the subject, the youth determined that their fellowship was a church and that Wayne was their pastor! Soon the Gordons’ storefront living room was packed, and guitar-strumming young professionals showed up to lend support. The teenage “elders,” concerned that white folk were molding the young church to their own cultural preferences, called a closed meeting. They unanimously voted that while others could attend, only neighborhood residents could belong to their Lawndale Community Church. Curious parents began joining. Professional outsiders relocated to the community. Today 600 families attend the church, which has reclaimed entire city blocks, started small businesses, and operates a health clinic and a residential drug rehab program. My Response: Do I see ruling out commuter church growth as negative or positive? Showing Our True Colors – Well, Excuse You! One morning I was in the kitchen preparing food at the counter. Susan needed something on the other side of me. Without saying a word, she reached across me to get it. That was the last straw! “Susan,” I blurted, “you can’t keep violating my personal space any time you feel like it.” In Korean culture, she explained, a sign of friendship is to treat one another like family. There’s no need for such formalities as “Excuse me” or “May I try some of your food?” She’d just been paying me the compliment of being relaxed in my presence. As Susan spoke, I became aware of my own unwritten rules. We white people, I thought, are very dependent on verbal cues for interactions. My Response: Do I let a friend shape how I view him or just make up my mind about him on my own? Showing Our True Colors – Who Died? A dozen years ago, my wife and I parachuted into Columbia, Maryland, to start a multicultural church. This community of 95,000 is racially diverse; we hoped that would increase our odds for success. But you can count on one hand the churches there with significant integration. Planting Bridgeway Community Church proved difficult. The inspiration and resolve from that Sunday lives on. Today Bridgeway is 60 percent African-American; 13 percent Asian, Latino, or other ethnicity; and 27 percent Caucasian. We celebrate the beauty in the body of Christ within our congregation. And it’s rich! My Response: What cultural preferences might I have to forego in a diverse fellowship? Moving to an urban Boston neighborhood after high school opened my eyes to the tensions between African- and Asian-American residents. “They call us ‘chinks’; we call them ‘niggers’!” blurted out the Korean-American owner of a mom-and-pop store who lived across the street. Today he visits his son and grandchildren in a multi-ethnic church that is a sister congregation to our own. Our church is intentionally becoming multi-ethnic. But my wife and I at times grit our teeth as we entrust our kids to the nursery or Sunday school classroom. Why? Because “red and yellow, black and white” make comments about each other without thinking. “Why do your eyes slant? Because you’re Korean!” my adopted Chinese daughters heard from one classroom. “I don’t want to put my kids in a class with inner-city kids!” exclaimed a suburban African-American dad another week. “That teacher is a Jew!” muttered an Arab man, shaking his head as he exited our English-as-a-second-language (ESL) class. My Response: Does my church conform to, or resist, community racial patterns? During a research stint at Oxford University, I visited historic All Souls Church in London. The preaching of its eminent pastor John Stott was insightful. But it was the array of nationalities that amazed me. I was greeted by people from all over the world. This, I thought, must be what heaven is like! This vivid picture of the church purchased by the blood of the Lamb isn’t only in the mind of John but in the heart of God. 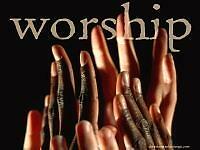 Can you imagine segregated worship services in heaven? Are only white Anglo-Saxon Protestants there? Black Baptists? Korean Presbyterians? Latino Pentecostals? Of course not! So now picture a colorful rainbow of saints singing a chorus of worship and praise to the Lamb here on earth. My Response: When have I experienced a true cross-section of Christ’s church all together? David A. Anderson is the founder and pastor of Bridgeway Community Church, a multicultural congregation in Columbia, Maryland. He earned a doctorate in sociology and religion from Oxford University and teaches cultural diversity at the University of Phoenix’s Columbia campus. He also hosts Reconciliation Live!—a Washington DC, radio talk show on race relations. I was in Orlando as a consultant on diversity for business leaders. I was surprised at how segregated Orlando is. But near our meeting place was a Wal-Mart. When I walked through its doors, I bumped into Koreans and Puerto Ricans, whites and blacks, the disabled, the young, and the aged. Hmm. While churches worship uniculturally, Wal-Mart spans color, class, and cultural lines by meeting the common needs of various groups. The common value that draws people to the Wal-Mart is their desire for a myriad of products for less money. Rich or poor, white or black, young or old, most people want to save money. Your vision for ministry, if it doesn’t include cultural diversity, isn’t 20/20! What is the church’s common value that will cause people to come together? How will our churches become places where the common needs of all are met? How can they learn to be a place where everyone feels welcome, included, and valued? When we discover the answers, people will surface from pockets of obscurity.